Rotarian Emily McIntosh doing the most good ever! Thanks for braving the cold weather to support the Salvation Army! 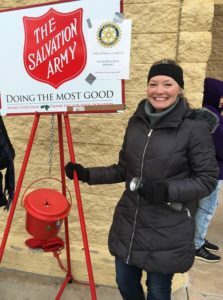 2017 — Another year of Madison Rotarians supporting the Salvation Army’s Red Kettle Bell Ringing. A very cold Saturday morning didn’t deter our participation of this annual event at Madison’s Wal Mart on Highway 20. It’s just not Christmas until the bells ring. Thanks to Rotarian Gail LeCroy who organizes this every year. 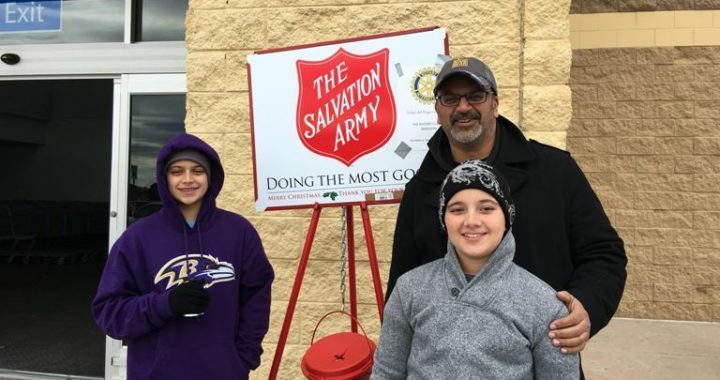 Pictured above is Sandy Patel and his sons who braved the cold to support this great effort. Posted in Community Service and tagged Christmas, Community.